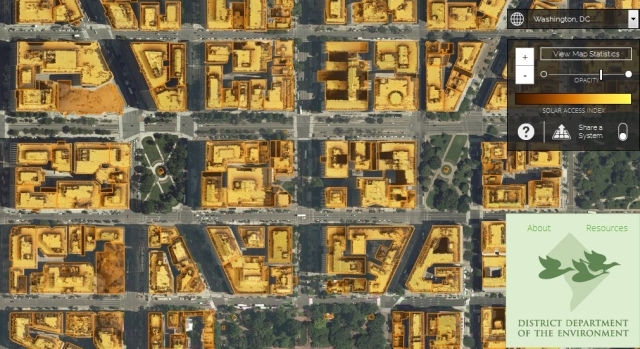 A rooftop solar mapping and assessment tool developed at MIT could eventually make it dead simple to discover the solar potential of every single rooftop in a city. The tool, called Solar System, uses high resolution mapping data to create a 3D model of the entire community, including roofs and trees, and then calculates their solar potential by analyzing it against historical weather data. The Solar System platform, licensed exclusively to the startup Mapdwell, aims to make it easier and more intuitive to have a cost-benefit analysis done on rooftop solar for each house, and to enable people to make an informed decision about going solar. The tool currently has data for just 5 cities in the US, including Washington DC and Boston, but is continuing to expand. For homes that are within the covered areas, homeowners can use the tool to not only assess the roof’s solar potential, but to also size and price a home solar system, either based on their budget, their energy demands, or the size of the rooftop. Solar System provides a lot of data for each roof, including estimated costs, estimated savings, estimated payback period, and more, which could make going solar a matter of just doing the math. Mapdwell isn’t solely about solar energy, but rather is focused on using data and design to drive sustainability, and by providing accurate and unbiased information with a similar approach to other urban design issues, such as green roofs or rainwater harvesting, it could enable much better decision-making and planning in communities.